The concept of a vertical ball and cup had already existed for decades by the time of the civil war. We have found one illustration of a girl playing with a ball and cup similar in appearance to the one we carry except no handle is in evidence. The design we have selected for this ball and cup is similar to but smaller than a ball and cup in the children's room at Arlington House, the pre-war residence of Robert E. Lee. The guides there responded to our question about the toys by telling us that Lee may have brought them back from Mexico. 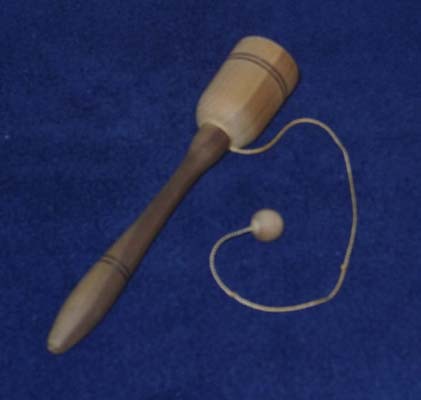 A type of ball and cup that is frequently mentioned in period literature and seen in illustrations is a following item in the catalogue, the bilbo catcher.